The meeting was centered around just a few specific topics. One, an allegation of a violation of the Open Meetings Act. Appointments to committees was also important. The discussion of fuel oil bids, the specifics of two board members being told that they could not vote due to a possible conflict of interest, and the topic of snow removal related to the township buildings and the sidewalks in St. James Township. The Board decided not to plow or blow snow off any sidewalks this winter. While every person on a team is important to the team's success, it is always interesting to view the team players as individuals and to praise them for their successes. Here is the stats sheet from Coach Matt Ritchie for his soccer team. These stats are from regular season league play and do not include the Northern Lights League Tournament Stats. An excellent season! Go, Islanders! More wind and more rain can't dampen the spirits of all the younger children as they get ready for the Halloween weekend. 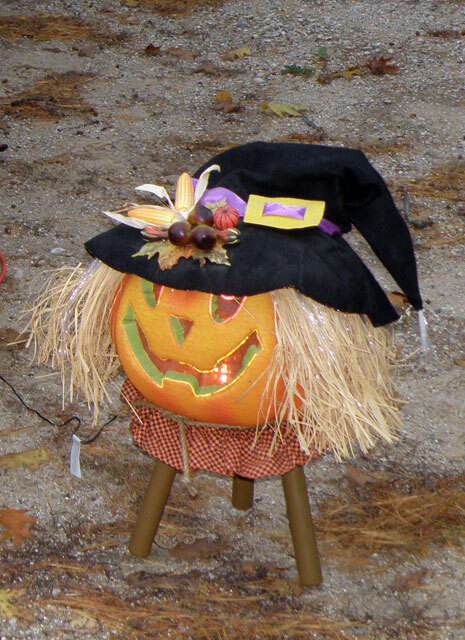 Today's costume parade around the town was canceled due to the rainy and windy weather, but tonight's Halloween party at the Peaine Township Hall is still on. 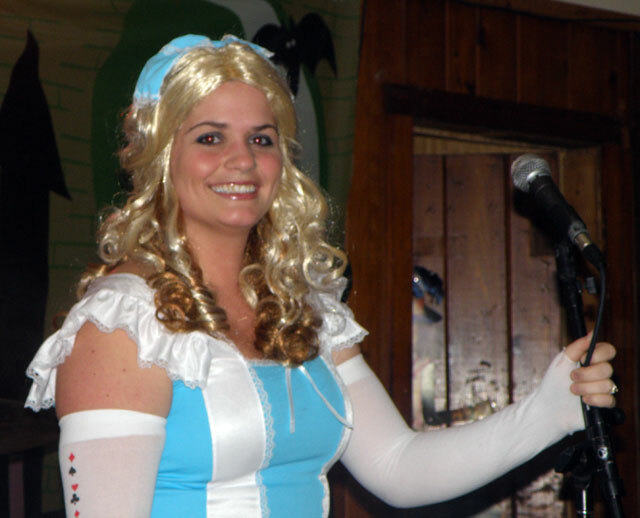 There is also a Pig Roast at the South End Lighthouse School, music at the bars, and Devil's night tonight, October 30, 2009. (11/2/09, 10 a.m.) Shortly Sally will be going through chemo for about 4 months. A check up after the 4 months than a possibility of radiation. Sally says she feels good and cannot believe there is anything wrong with her. 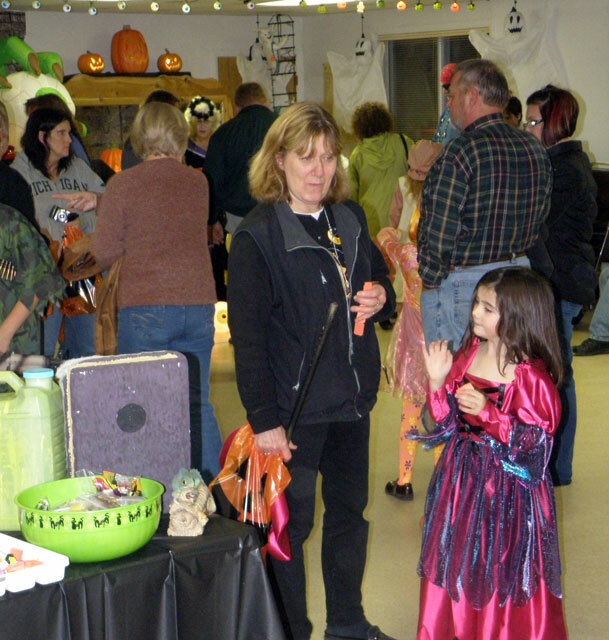 (10/30/09 8:50 pm) Held on October 30, 2009, beginning at 7 p.m., the Halloween Carnival was packed wall-to-wall in the Peaine Township Hall. 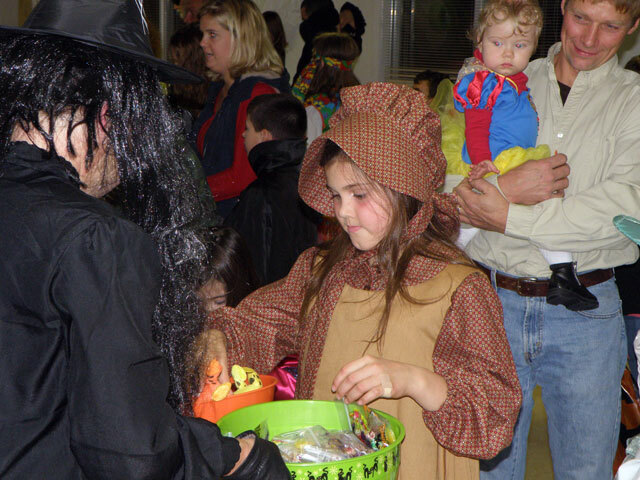 There were games and refreshments, but the the best part from an adult's perspective was the look in the eyes of each of the children in costume. Their eyes just lit up with the excitement of the night. From the games like "Throw the Toad" to the "Misfortune Teller" to the refreshments, this event was well organized. More story and pictures HERE. Tina Walker said, "A very special thank you to the volunteers! Without you, this would only be a dream of mine. Thank you for your generous hearts and thank you for making my dream come true in hosting this event for the children of our community! Jayne Bailey - The Witch - Toad Toss Game; Jenna Butler - Bat - Dracula's Demonic Dice Roll Game; Cathy Garland - Spider Lady - Spooky Spider Ring Toss Game; Cindy Gillespie-Cushman - Greeter / Security; Alex Kuligoski - Fortune Teller - Misfortune Teller; Hannah Robert - Ticket Girl; Betty Scoggin - Ghost - Monster Duck Pond Game; Donna Stambaugh - Sorceress - Eerie Eyeball Toss Game; Doug Tilly - Mad Scientist - Bloody Brains Bucket Game . Thank you to the Beaver Island Business and organizations for their generosity in supporting this event! Beaver Gems, Inc. & Shipwreck's Shirt Gift Shop, Beaver Island Trading Post, Central Drug Store, CMU Biological Station, East Wind Spa, Fresh Air Aviation, R. Gillespie Enterprises, Inc. (Thanks Marie), Hogarth's Pest Control Company, Island Airways, Martin Gas & Oil, Montaage, McDonough's Market and Dalwhinnie Bakery & Deli, Power's Do-It-Best Hardware, Shamrock Bar & Restaurant, Harbour Market & The Beachcomber, TDS Telecom, Whimsy, andJim Wojan Excavating. A heartfelt thank you to my mother, Myrtle Walker, for all of her love and support." When asked why she does these activities, Tina Walker said, "I love children and love seeing them have a good time. 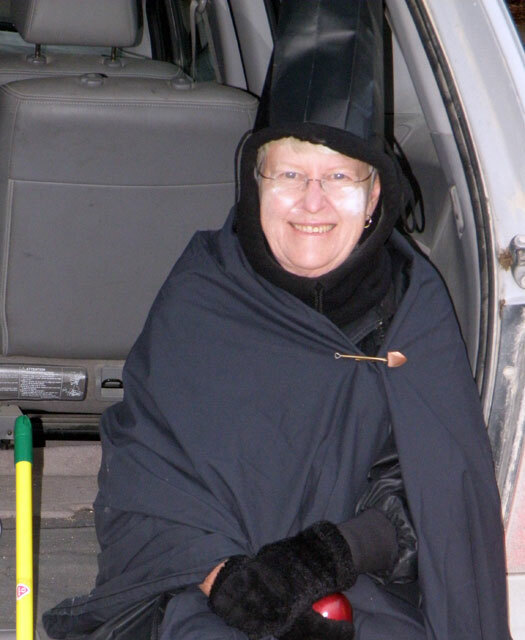 I have been collecting holiday decorations for over 35 years, I really enjoy decorating for holidays and that my reward for everything that I do lies in the smiling faces of the children, and my volunteers feel the same way." 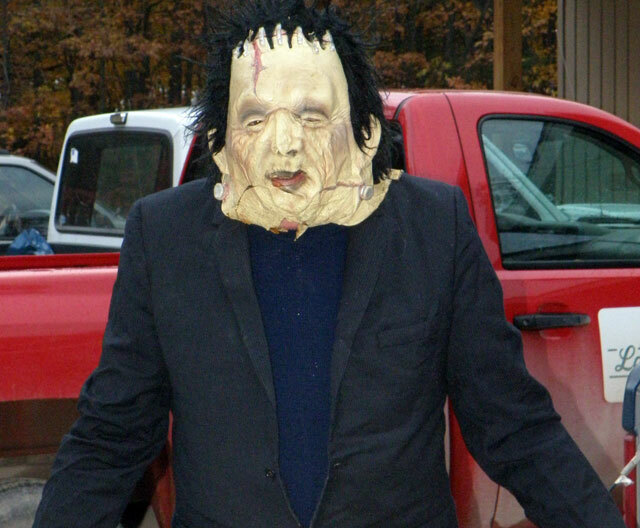 In this season of Halloween, there was an all out effort to allow the out of town residents and opportunity to see the the trick or treaters and to provide the youngsters with treats. 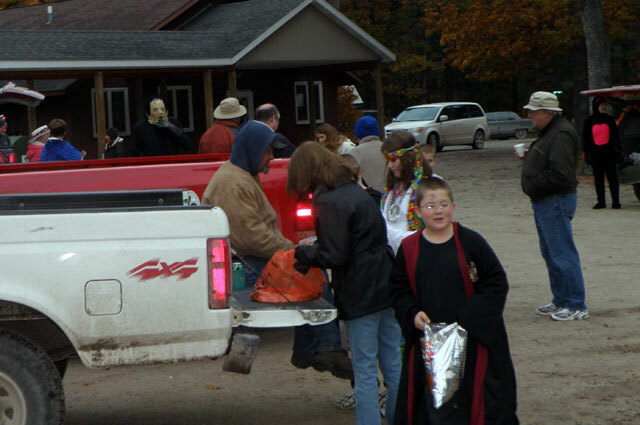 The trunk and treaters just drove their vehicle into the parking lot of the Gregg Fellowship Center on October 31, 2009. 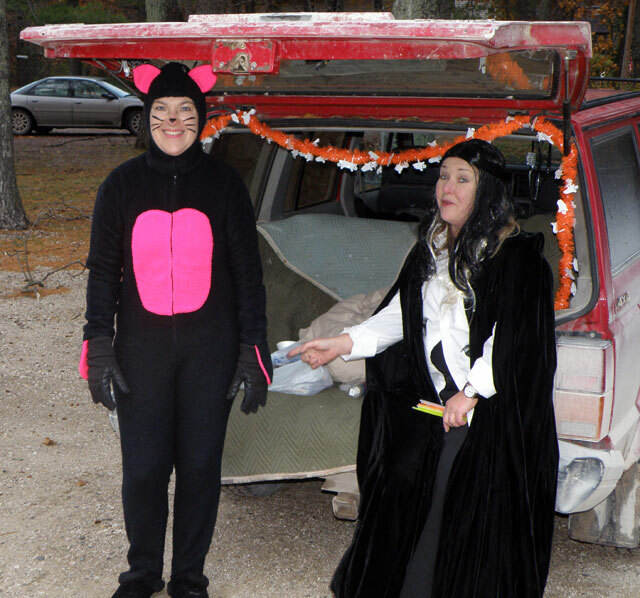 The "trunk" and treat event will began at 5 p.m. and ran until 8 p.m.
A wonderful success with hot cider inside the fellowship center!! Quicktime Streaming Video Clip of "Trunk and/or Treat"
This photo was sent in by Bob Tidmore as an example fo the Devil's Night blockades done on the Island on Halloween night. It blocked the road fairly well. The Sowa Brothers (Jeremy, lead guitar and vocals; Cory Sowa, bass) with Hilary Palmer (vocals), Randy Osborne (vocals and guitar), and Brandon Maudrie (drums), all made the party at the Shamrock Bar and Restaurant on Saturday night one to remember. The music was exceptional and the dueling guitar solos between Jeremy and Randy were well worth sitting and listening, but many wanted to dance, and that is just what this party was made for. Randy sings "Can't You See"
If you're in the mood to take the dog for a walk, you might consider taking him/her out to Gull Harbor. 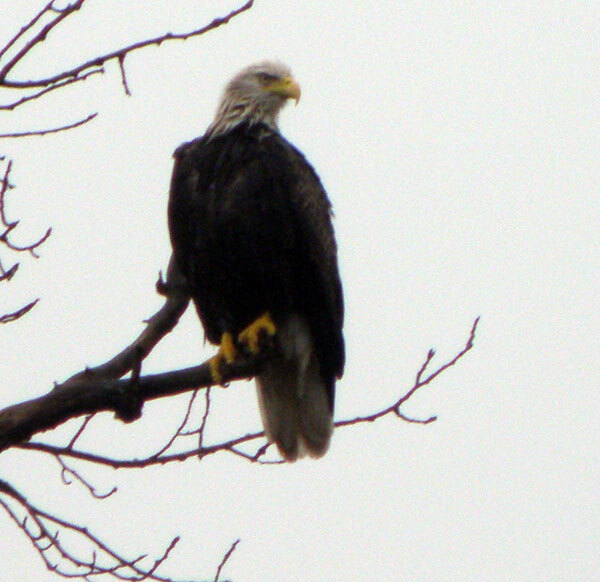 If you do, if it's rainy, or if you're just lucky, you'll get an opportunity to see an eagle or more than one eagle on a branch in one or more trees. 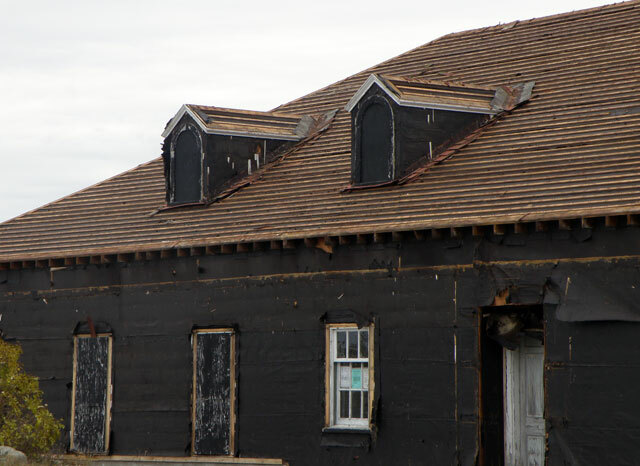 The boat house at Whiskey Point is getting a complete makeover this fall. As already reported in the video clips and the minutes of the St. James meeting for October, CMU is changing the siding, the windows, and the roof. Although the materials to be used will be modern materials, CMU will attempt to provide an historically correct replacement of these items. It will be interesting to see the results. In the off season, this feature seems to be quite popular. Even if gun deer hunting season isn't over yet, it ought to be easy to remember where you saw this. Send you answer to medic5740@gmail.com. (10/31/09 10 a.m.) Mark Vaniman, a 26-year veteran of the U.S. 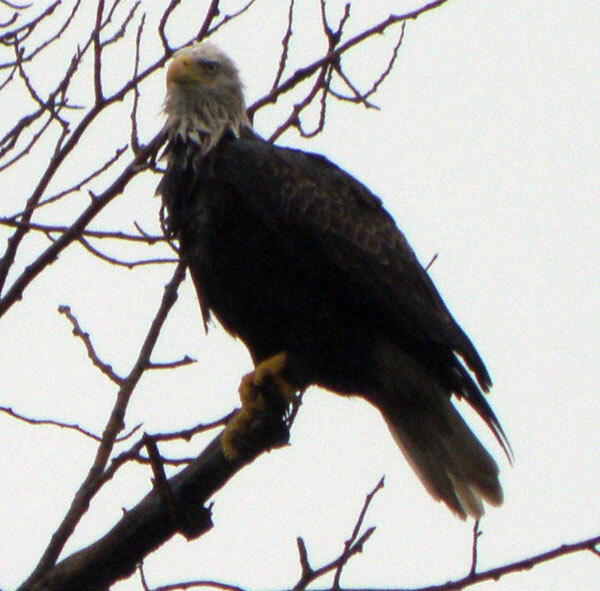 Fish and Wildlife Service, is the new refuge manager at the Seney National Wildlife Refuge, Michigan. He began his new duties on September 14, 2009. In his previous position, Vaniman served as Project Leader at Windom Wetland Management District. 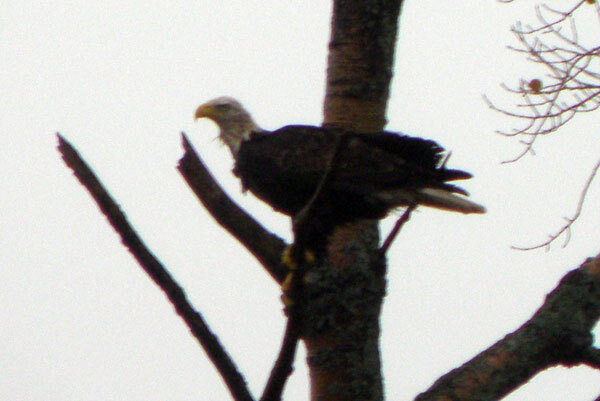 Established in 1943, Seney National Wildlife Refuge is a resting and breeding ground for migratory birds. The 93,000+ acre refuge is home to bald eagles, osprey, common loons, trumpeter swans, river otters, beavers, black bears, moose and gray wolves. “My goal for the refuge is to help the public access and enjoy wildlife while finding ways to protect federally-listed and native species,” says Vaniman. The above news release effects Beaver Island's Archipelago due to the outlying islands being part of this refuge. This will be the new contact person for any cormorant issues regarding the outer islands that are part of this refuge: Hat, Shoe, Pismire, and Gull.  removal of snow from areas as determined through meeting with school administrator. I assure the Beaver Island Community School Board of Education that I will perform all needed snow plowing for the entire 2009-2010 school year. Damage done to school grounds while plowing must, in the spring, be repaired to the school's satisfaction .  Bids must be received in the school office by 3:00 p.m. on Friday,November 6, 2009 . Recently the Marathon Principals Committee (made up of the primary event sponsors) met to begin the planning process for next year. 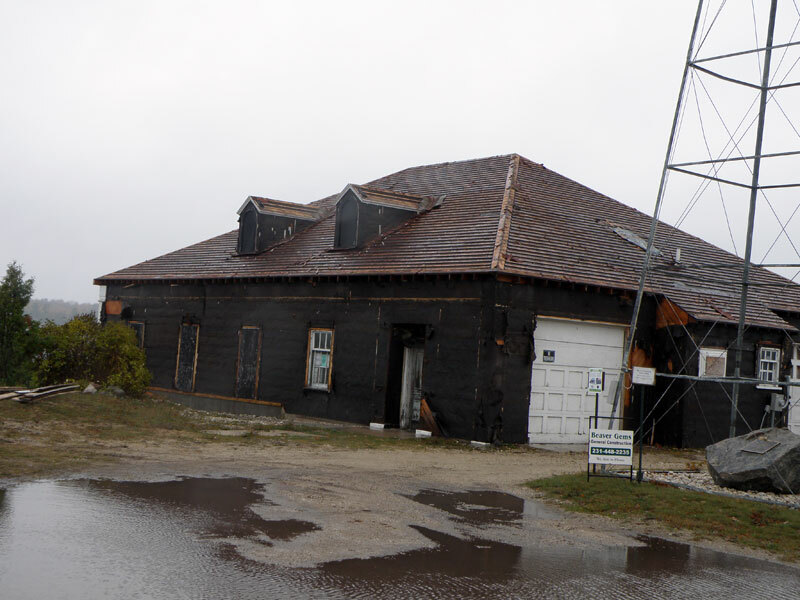 The group reviewed comments from many interested parties including runners, business owners and Beaver Island residents that totaled 12 single spaced typed pages. Comments were 95% positive with suggestions for improvement. We hope people will understand that differing interests made it impossible to implement all the good ideas. September 4 th has been selected for the 2010 Beaver Island Marathon. We want to share with the community a few of the many factors which influenced the decision to select Labor Day weekend again and some planned improvements. 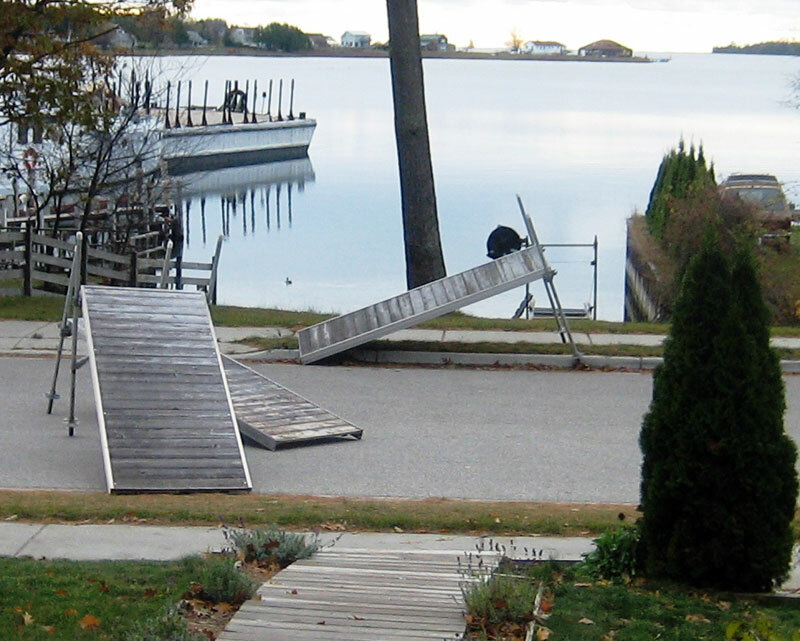 Frankly, for the last several years prior to this, Labor Day weekend has not been a great one for Beaver Island. 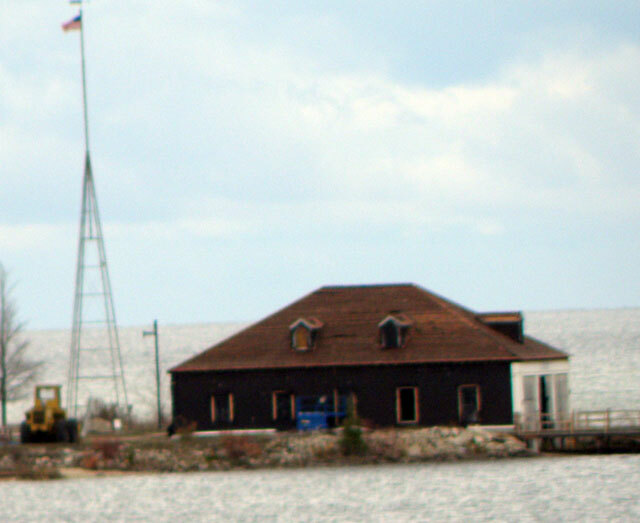 In 2009 boat and air travel to Beaver Island during the three day weekend increased nearly ten fold. They came from 16 states and Canada. 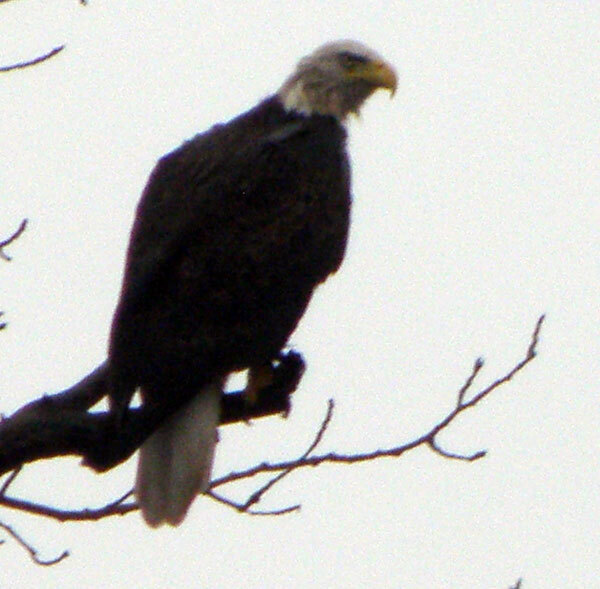 Most were first time visitors to Beaver Island. Overwhelmingly they said they had a wonderful time, want to return and many plan to bring more family and stay longer. For a large number the three day holiday weekend was a key to being able to come and spend 2-3 days. The event was a big success because of the warmth and hospitality of the Island and the professionalism of Good Boy Events. Pushing the event further into September historically risks windy weather not suitable to comfortable travel. Moving back into August bumps into greater likelihood of hot weather and booked accommodations. Other long standing mid-west running events are also a factor. Late June is a future possibility, perhaps for a triathlon. Again being candid, some of us under estimated the economic impact and were not completely ready to deal with the numbers. The first event is always a learning opportunity. Planning for next year is already underway and numerous opportunities for improvement have been identified. To mention a few changes: A new 13.1 mile course that will reduce and shorten the business impact of less vehicle traffic; More participation by business along the course route; Additional marketing focus on extending the Beaver Island visit. We believe there is plenty of opportunity to make next year's Beaver Island Marathon bigger and better for the participants, the promoters and our Island. We welcome questions and suggestions from the community. Kathy Speck is President of the Beaver Island Chamber of Commerce. Steve West is the Executive Director. 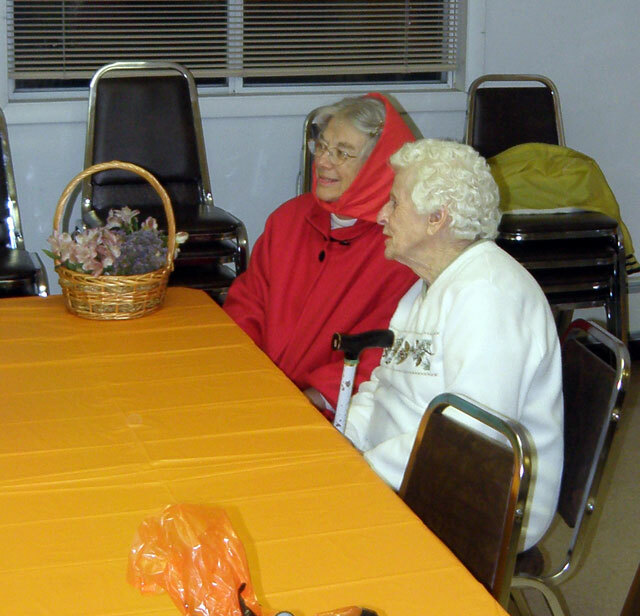 There is a a holiday bizaar scheduled to take place at the Beaver Island Christian Church Gregg Fellowship Center on November 22, 2009. It will run from 11 a.m. until 3 p.m. If you are interested in renting a $10 table for this event, please contact Karen Johnson or Judi Meister. Besides the vendors there selling items for the holiday gifts, each vendor will donate an item for a "Vendor" raffle with tickets on sale for 25 cents each. What would a bizaar be without food? There will be a soup kitchen with soup on sale to benefit the Beaver Island Food Pantry. Looks like an exciting day for all! The health occupations class will be having a bake sale on November 8, 2009. The adult medical first responder class will begin on November 16, 2009, at the Governmental Center (the old medical center). If you are interested and haven't contacted the instructor Sarah McCafferty, please do so right away. The Area Agency on Aging 1-B (AAA 1-B) is concerned that many of Michigan 's estimated 130,000 snowbirds may get missed in the upcoming 2010 census—costing the state millions in federal dollars that are allocated based on census numbers. The problem lies in the timing of the census. In March, the 2010 Census forms will be mailed to every residence. Residents will be instructed to complete the form and return it by April 1 st . However, many Michigan snowbirds may complete and return their census form at their southern residence, and not be counted as a Michigan resident! If retirees reside in Michigan for more than six months out of the year they should be counted as a Michigan resident , so that Michigan receives the federal benefits for them. Each person who is counted in Michigan brings more than $1,000 to Michigan each year in federal funding. The 2010 census count determines funding to state and local governments, money for roads, schools, businesses, and services for the elderly.  When you receive a Census Questionnaire at your winter address, do not fill it out if you live there for less than six months out of the year.  If you return to Michigan before April 15, fill out the Census Questionnaire that will be delivered to your Michigan address.  After April 15, or if you do not find a questionnaire when you return, wait until the Census sends a census taker to your door to get a form completed. Michigan needs all snowbirds who live here most of the time to be counted here, to help our state, our cities, and our neighbors receive a fair share of federal resources. 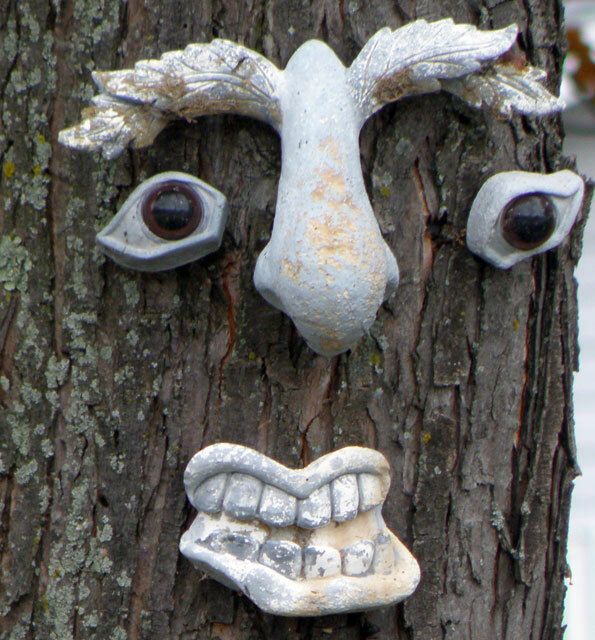 Talking Threads says, "EVERYONE IS WELCOME!" Talking Treads Quilt Guild had a workshop featuring a class in "Foundation Crazy Quilting." 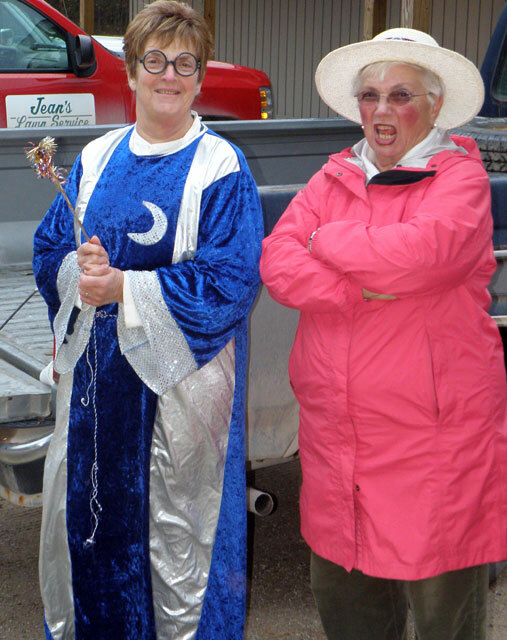 It took place at the Peaine Township Hall on Saturday, October 24, 2009 from 10 a.m. until 5 p.m. The parking lot at the Peaine Hall was pretty full which would indicate that this was a successful event. There will be an AA meeting every Tuesday, Thursday, and Saturday nights at 7 p.m. at the Beaver Island Christian Church. 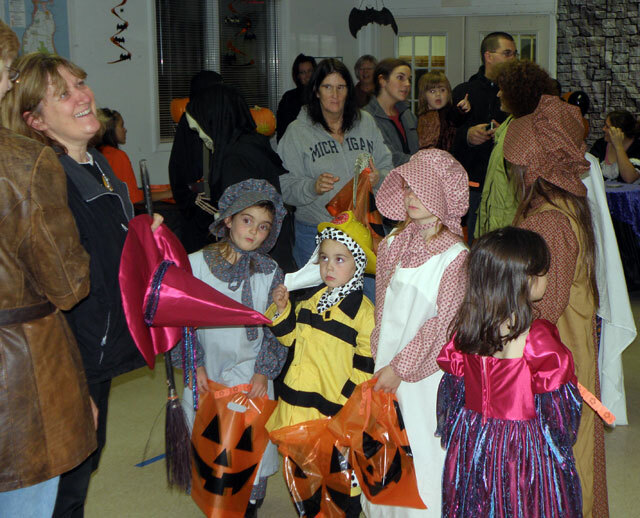 The Beaver Island Community Center hours of operation will be reduced now that the peak season has come to a close. Beginning the last week of October—on the 26tth—the Center hours will be from 10:00 a.m. to 6:00 p.m. Monday through Thursday , and from 10:00 a.m. to 9:00 p.m. on Friday and Saturday . 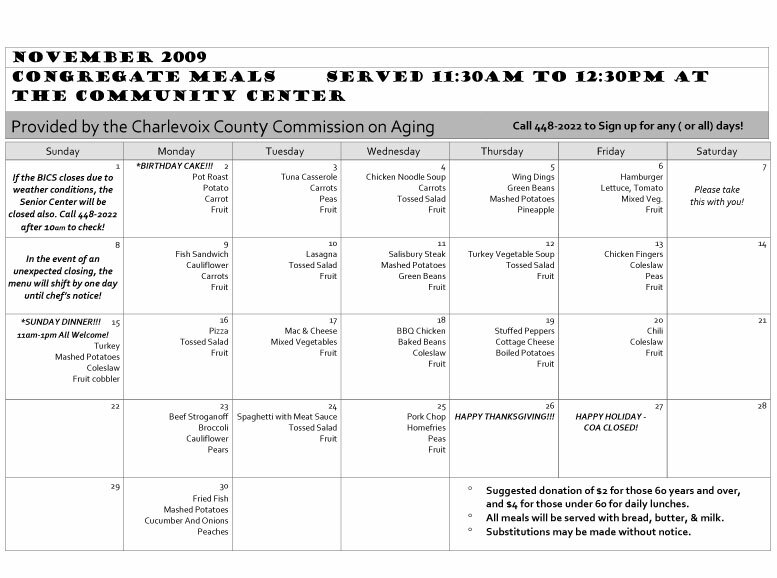 The Center will close on Sundays , except for once-a-month occasion when the COA dinner is served. Current plans are to keep these hours until Memorial Day week-end in 2010. Movies and events will normally be held on the week-ends. The Center staff encourages everyone to check the event listings on www.BeaverIslandCommunityCenter.Org ., as well as in the local papers, and at the Center. 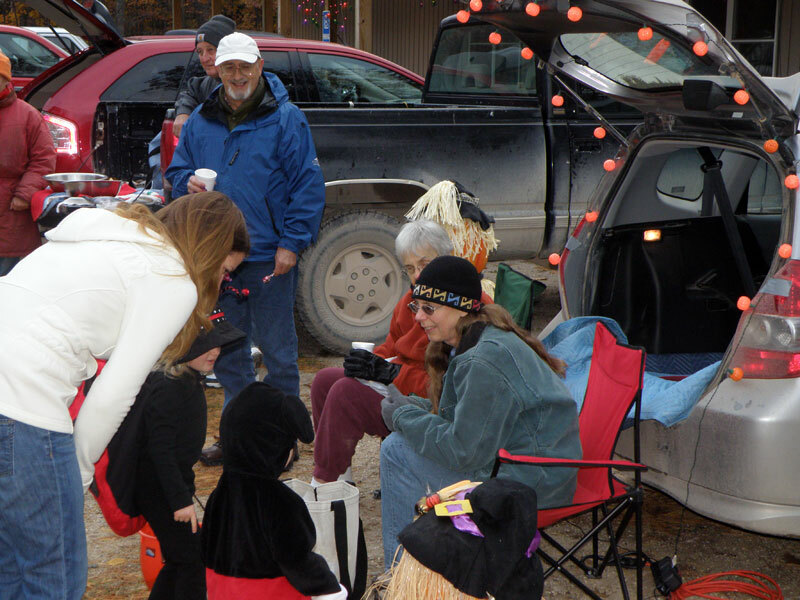 The fall, winter, and spring seasons will bring a variety of activities for the Island Community's enjoyment.  Mondays & Thursdays: 10:00 am – Arthritis Foundation Exercise Program! A certified community-based recreational exercise program designed to assist in reducing pain level, increase flexibility and mobility, and enhance the ability to cope with arthritis and daily activities. Two classes per week, each progressing with different fun activities, information, exercise routines and relaxation techniques. Sign up now at 448-2022—or just come join us.  Tuesdays: 12:30 pm – Make Me Laugh! Get your week in proper gear with the best medicine around— laughter! Rowan & Martin's Laugh-in, Red Skelton, Bill Cosby (when he did stand up! ), even funny pet videos! Check listings at the Community Center or at www.BeaverIslandCommunityCenter.org . Celebrate the month's Senior Birthdays with cake, ice cream and “extra” goodwill! Great food, company and fun for the whole community! Suggested donation for Seniors 60 and older is $3, and those under 60 $6. 5 pm : PABI KUBOTA raffle drawing!!!  22 nd 11 am -2 pm – Christmas Bazaar At the Beaver Island Christian Church.  26 th & 27 th The COA will be closed for the Thanksgiving Holiday ! Happy Thanksgiving to you and yours!  30 th – “Grandfriends” Gingerbread House Construction Zone Join Master Designer and Builder Heidi Conner as she leads novice through experienced on a lip-licking adventure into edible architecture! 2-5pm, Materials (and treats) provided, and you are welcome to bring some too!  Sign up at 448-2022. Fee TBD.  5 th & 6 th – Christmas Contata Check listing for times and location.  11 th & 12 th 8 pm – Holiday Hilarity The “world premiere” of the all-new Beaver Island Comedy Groups' original holiday production!  15 th – Beaver Island Community School Christmas Presentation An unforgettable staging of holiday spirit! 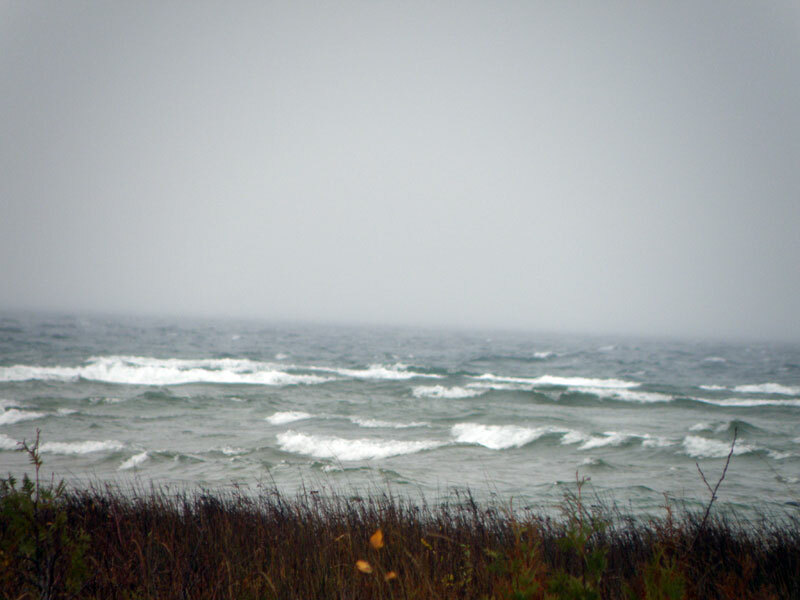 The Beaver Island Cultural Arts Association (BICAA) is initiating a new mini-grant program in 2009-10 to support the creative work of local artists who enrich the cultural life of the Beaver Island community. Funding for the program is generated by proceeds from Baroque on Beaver, an annual classical music series that combines the talents of year-round and seasonal residents with professional musicians from across the state of Michigan and beyond. The new program was created by the BICAA Board of Directors as a means of fulfilling its mission to support year-round cultural arts in the Beaver Island community. BICAA has previously invested proceeds from Baroque on Beaver in the string program and other cultural activities for students at the Beaver Island Community School (BICS). Since BICS recently received a major grant to fund similar projects, the BICAA Board decided to refocus its resources on supporting the work of local artists. Artists will be able to apply for funding to cover costs for such necessities as time and materials to create their art, rental of rehearsal and performance space, travel expenses or fees for attending seminars or classes, opportunities to branch out into new art forms and other reasonable needs. Eligibility criteria and applications for the mini-grant program may be obtained from BICAA Board member Miranda Rooy, mirandarooy@hotmail.com and will be posted in mid-October on the BICAA website, www.baroqueonbeaver.com . Applications will be accepted electronically and must be received by November 15, 2009 . A Selection Committee composed of Board members and community residents qualified in specific areas of the arts will review applications and make recommendations on awardees for Board approval. Awards will be in mid-December. For more information, please contact Anne Glendon, aglendon@sbcglobal.net . Other needs consistent with the type of art involved. Agreement to report on, share, demonstrate, show or perform whatever work is produced as a result of the grant during the Baroque on Beaver annual festival (July 26-August 1, 2010), or at another event to be sponsored by BICAA in association with the festival . 2. Purpose of request: Please describe in one paragraph what the funds will be used for. 3. Statement of Need: Please explain (no more than 1 page) why you are seeking funding at this time. Describe your engagement in this art form over the past 2 years and give a compelling reason why this mini-grant is important to achieving your artistic goals. 5. Letter of Agreement: Please attach a letter (or multiple letters from all the members of the applicant group) that clearly states agreement with the requirement to show, display or otherwise demonstrate how the mini-grant funds were used by July 15, 2010 . Please use additional pages as needed. Grant monies are still available for preventative care at the Beaver Island Rural Health Center. Please encourage anyone who might benefit from these services to call for an appointment. The service is available to those members of the community who are not insured or whose insurance may not pay for a routine physical. We are offering screening for diabetes, high blood pressure, high cholesterol, thyroid disease, prostate cancer and anemia. There is no time limit on this offer. We are grateful to Char-Em United Way allowing us to offer these services. To date 14 residents of the island have taken advantage of the opportunity for preventative care. Two residents have had hypertension diagnosed and are being treated and one resident has been diagnosed with a blood disorder and has been referred to a specialist.